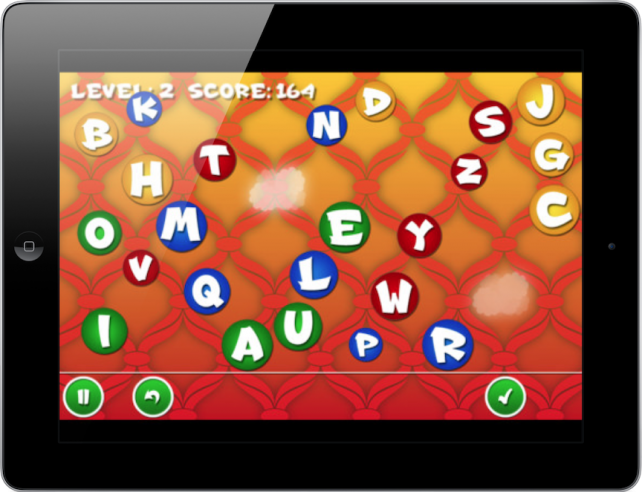 Word Ball is a challenging iPhone/iPod touch game that is educational and fun too. The game�s goal is to make you a �Word Master,� by making users think on their feet when building words as quickly as possible. Now, the app has gone universal and some of our readers can get the app for absolutely free because we�ve got some promo codes from the developer. Created by�Continuous Integration, Inc., Word Ball requires users to spell words using letters that float across the screen. And yes, the letters are each in a ball, hence the title of the app. Each letter is assigned a different value. Naturally, the longer the word, the more points you�ll receive. However, the game isn�t as easy as it sounds. For one, as you move through the game, the balls begin moving around the screen at a quicker pace. Plus, they begin to shrink. Finally, the longer you take to figure out a word, the more likely the game will end and you�ll have to start all over. The $.99�Word Ball game is a terrific app and comes recommended for those older than eight. A�free version is also available. Free users can upgrade their app to the full version by making an in-app purchase.